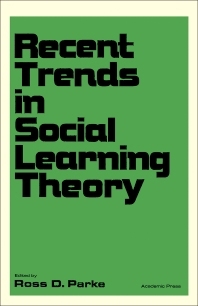 Recent Trends in Social Learning Theory offers a convenient overview of the state of social learning theory. This book is organized into six chapters. Chapter 1 provides a detailed discussion of the social learning theory, followed by an analysis of the theoretical views on the social reinforcement issue in Chapter 2. The contiguity theory of modeling and important role played by symbolic coding processes in imitation are described in Chapter 3. Chapter 4 elaborates the developmental analysis of imitation, while Chapter 5 outlines an empirical and theoretical overview of the status of punishment and its role in the development of self-control in children. The last chapter summarizes the contributions compiled in this text. This publication is recommended for students and professionals in child development and social and clinical psychology. Chapter 6. A Developmental Memoir of "Social Learning Theory"